With a great architecture comes great responsibility. A strong feature set, great performance out of the box, and a design that doesn’t overdo the RGB lighting like some do. It's fair to say that the first generation of Ryzen motherboards had its problems at launch. While most of these have since been ironed out, a second-generation chipset brings with it a certain level of reassurance. You just know that those little nips and tucks will make for a better user experience. Indeed, this is exactly what we found when using this motherboard—everything simply worked first time. There's more to this new MSI mobo than the fact it works, though. It's worth noting that there isn't a lot that's obviously new with the X470 chipset when compared to the older X370. In fact, looking down the spec sheet, there's only one standout inclusion, and that's support for AMD StoreMI storage acceleration—which is essentially a smart caching solution that combines the capacity of your hard drive with the performance of your SSD. As ever with such things, serious performance junkies will get more from a large, fast NVMe SSD, but it's good to see that AMD is thinking outside of its traditional box. 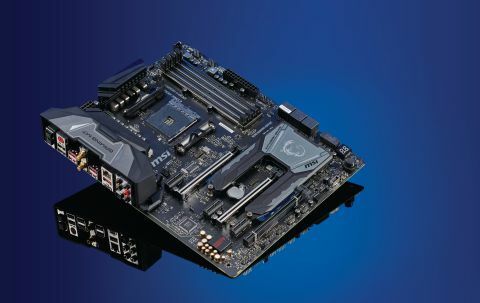 MSI has augmented this base chipset with a plethora of features that elevate it above the norm. You'll find support for RAM speeds up to DDR4-3600, twin M.2 slots, high-end Nihimic 3 audio, Killer Ethernet E2500, Intel wi-fi/Bluetooth module, support for dual graphics cards, and even a smattering of RGB lighting. That lighting (termed Mystic Light) is fairly subtle, and if you're determined to make your build shine, there are brighter options out there (the Gigabyte X470 Aorus Gaming 7 lights up like a Christmas tree). Lighting aside, it's a fairly sober design, with the black and silver styling working well in our view. The black and silver cooling plate that covers the southbridge extends over the two M.2 slots, providing cooling and protection for your SSDs. The first of these uses the CPU's PCIe 3.0 x4 connection, while the second is routed through the motherboard chipset, and is actually a PCIe 2.0 x4 connection. It's worth noting that you'll lose the third SATA port if you attach a SATA M.2 drive to this connector, or the last PCIe slot if you connect a PCI M.2 drive. And no, you can't build a RAID with these slots, in case you're wondering. There's a clear confidence on show here that lets you know that you're getting a mature motherboard that will give you the most from the new Zen+ chips. This board is compatible with the original Ryzen family as well, and likewise X370 motherboards can be flashed to support the newer Ryzen 2000-series processors, too. In fact, the new X470 motherboards aren't a direct replacement for the existing X370 motherboards, and both will be on sale going forward. When it comes to performance, we benchmarked this board with the original Ryzen 7 1800X, so we could easily compare it to MSI's X370 XPower Gaming Titanium. The good news, from the off, is that the MSI X470 Gaming M7 AC outperforms, or at least matches, the older board in every test, bar one. The difference can be subtle at times—we're looking at 1 percent in some tests—but better it is. The exception is the power draw, where the older board isn't as greedy as this one. As this is a halo product, it shouldn't be much of a surprise to find that it's a premium "enthusiast" class motherboard. Rolling in at a cool $260, it's not the cheapest way to get your AMD game on. Given that one of the big selling points of Ryzen is its great value for money, the cost is worth bearing in mind. Overall, this is a confident release from MSI. It boasts a strong feature set, great performance out of the box, and a design that doesn't overdo the RGB lighting like some do. It is on the pricier side, but if you can justify the price to yourself, it comes heartily recommended.